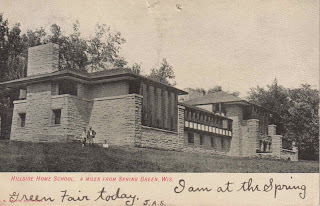 Okay, another trifecta of things I love - Frank Lloyd Wright architecture, Wisconsin and vintage postcards of places I've visited. This example shows the Hillside Home School on the grounds of Taliesin, just outside of Spring Green, Wisconsin. Click on the card for a larger image - I dig the three schoolboys looking at the camera. Allie and I toured the School back in the mid-1990s while camping at Tower Hill State Park and cycling around the Spring Green area. I don't remember exactly why we didn't take a tour of Taliesin itself - it was likely a combination of not having enough time and not having enough money. Still, we thoroughly enjoyed walking the grounds and seeing the school. Okay, on to the card. This card is postmarked August 30, 1906 - three years after the school opened. 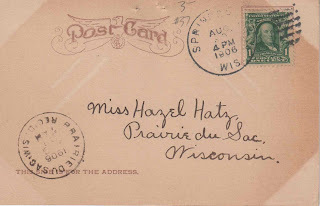 I tried doing a little Googling of Miss Hatz - no luck, although I did discover a number of Hatzes who settled the Prairie du Sac and Baraboo area. Thankfully the School is still standing proud 106 years after it's construction. I wonder what people thought of it back then. You can see some recent images of it here.